Gold is the “gold standard” for adornment and beauty, and is the symbol of love. It speaks volumes both in language and in culture. We live by the “golden rule” and people who make it in business have taken advantage of a “golden opportunity,” while in sports, athletes “go for the gold.” Wedding rings, which to this day still express the sharing of love, are made of gold in most cultures. 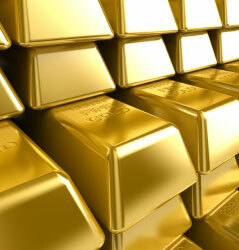 Governments of countries throughout the world regulate the quality of gold, its purity and fineness. Although regulations are not identical from one country to another, they are similar, and western countries tend to use the plumb gold standard. This means that the quantity of pure gold contained in alloys is regulated within strict limits. The variations allowed are called tolerances and are clearly defined. Canadian standards are specified in the Precious Metals Marking Act and its regulations. Pure gold is often called fine gold. An ingot of fine gold usually bears the hallmark “999.9.” This indicates that the gold is 99.99% pure and does not contain any metal alloys. The degree of purity of gold alloys can be expressed in two ways: over one thousand in the metric system, where 1000 represents pure gold, or over 24, where 24 also represents maximum purity. The denomination out of 24 originated in Great Britain and remains the one most commonly used in Canada and the United States. European countries mainly use the metric system denomination. In England, until 1793, all gold jewellery was 22 karats or more. In that year, 18-karat gold was authorized, with 15-karat and 9-karat gold being allowed as of 1853. In France, prior to 1994, all gold with a standard of less than 750 was not considered gold in the precious-metal sense. The lowest legal limit in Germany is 8-karat. In Canada, 9-karat gold is the minimum standard, while in the U.S. it is 10-karat gold. The law also stipulates that an item made of precious metal may also be sold legally in Canada without a hallmark, a quality mark or a trademark. The abbreviations “karat”, “carat”, “Karat”, “Carat”, “Kt”, “Ct”, “K”, “C” or a designation in thousandths may be used to express the standard of a gold object with a minimum quality of 9K. Gold is gold everywhere in the world. Subtle variations in the colour of gold are simply due to the mixtures made with other metals to produce alloys. Sometimes, too, 24-karat gold plating is applied to a finished piece of jewellery, which gives it a very bright, shiny yellow colour. As for white gold, it is always slightly yellow and therefore, it is usually plated with rhodium to give it a hard, white, shiny finish. For a long time, platinum lived in the shadow of gold. However, at the beginning of the 20th century, it experienced its first glory days as jewellery in what became known as the Art Deco era. Today, platinum is used to a larger extent than ever. Platinum is a member of a family made up of six metals with similar properties. They are platinum, palladium, rhodium, iridium, osmium and ruthenium. They usually occur together in mineral ores. The most abundant are platinum and palladium. These six metals have common characteristics, including high melting points and good resistance to acids, corrosion and wear. The word platinum owes its origin to the Spaniards, who called it platina del Pinto. Platina means “little silver” and the Pinto was the name of the river in Colombia where the Spaniards found this precious metal. Indications of platinum being used come from the intaglios of Ancient Egypt. In those days, it was undoubtedly thought of as a “type” of silver. The Indians of the pre-Columbian era produced jewels made from a platinum alloy. Louis Cartier was the person responsible for popularizing platinum in jewellery making. He was among the first to use this pale grey metal with a satin lustre in 1890. The high melting point of platinum delayed its use in jewellery because it required the use of a specially adapted blowtorch. Undoubtedly the most common precious metal. It is also the most inexpensive and abundant. 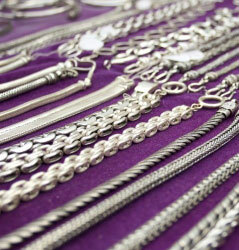 Just like gold, silver has been widely used for a great number of years by various civilizations. Silver is still commonly used today. Just consider cutlery, silverware and other tableware, coins, and technical or industrial applications, primarily in the photographic industry. The chemical symbol of silver, Ag, comes from the Latin argentum, which means, “white and shining”. The English word for it comes from the Old English siolfor. All ancient civilizations, whether Greek, Roman, Egyptian or Assyrian, used and appreciated this metal. Gold was associated with the sun and the sun god. Silver, naturally, was associated with the moon. In fact, it was the whiteness of silver that associated it with the colour of the moon and with Diana, the moon goddess. It was probably due to its relatively low melting point and high plasticity that ancient craftsmen found silver easy to work with. As silver is abundant and found almost everywhere, many civilizations worked with it leaving behind magnificent silver artifacts. Silver has been used in coins ever since coins themselves were invented. The purity of silver coins varied; it could be as low as 50% or as high as 100% fine silver. The minimum standards for designating silver as a precious metal vary from one country to another and from one era to another, but they are generally between 80% and 90% pure silver, by weight. Silver is a noble metal and resists most acids. However, it has great affinity with sulphur. It is also due to the sulphur present in the atmosphere that it tarnishes. This is not an oxidation or corrosion process. On contact with the air, silver combines with sulphur and tarnishes. When it tarnishes, only the surface is affected. Tarnished silver regains its shine when it is polished. 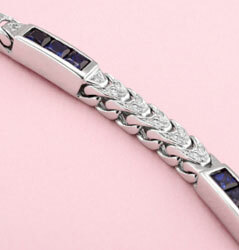 Rhodium plating prevents silver from tarnishing. © 2019 Bakelaar Jewellers. All rights reserved. Jewelry Store Website Design © VRB Internet Solutions Ltd.